Saint Louis Fed President James Bullard has been speaking out a lot recently. He recently proposed a new interest rate regime that, instead of focusing on models, uses a very intuitive decision tree to determine if raising rates is appropriate. 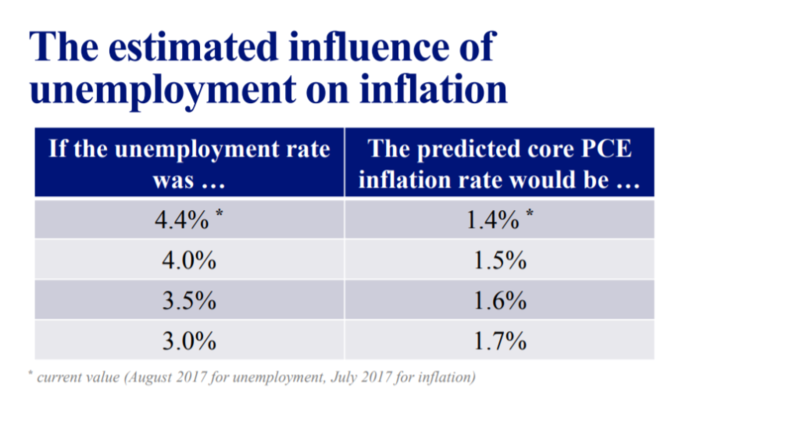 He gave a speech at the end of last week that asked three questions: would the US see GDP growth greater than 2% in the coming year, would inflation hit the Fed’s 2% inflation target and would wages increase as unemployment decreases. His answer to all three was, “Probably not.” And in a break from tradition, he relies on incoming data rather than models to support his conclusions. Since the third quarter of 2009, the average Y/Y growth rate has been 2.1% while the median growth rate has been 2%. There is little reason to project anything but moderate growth in the third quarter. Industrial production and real retail sales have both slowed. The three-month average payroll job growth is 185,000 per month -a solid rate but not one that warrants robust growth projections. Real income excluding transfer payments continues to increase but at a slower rate. The New York Fed’s Nowcast for third quarter GDP growth is 1.46% while the Atlanta Fed is calling for 2.8% growth The average of these two projections is 2.1%, which happens to be the approximate average of the blue chip forecasting consensus. The preceding information supports Bullard’s argument that there is a low probability of anything but more moderate growth. The BEA breaks PCE price data into three components: services, and durable and non-durable goods. Durable prices (in red, 10% of the index) have been subtracting from price pressures for the last 10 years. And their negative impact is pretty high: these prices have been contracting around 2% for the last year. Non-durable prices (in green, 20% of the index) are weak; they subtracted from inflation for all of 2015 and most of 2016, only recently adding any upward pressure. Their latest reading was for a 1.3% year-over-year rate of growth—hardly anything to be concerned about. That leaves services (in red, 70% of the index) to create all the upward pressure that the Fed needs for PCE inflation to hit 2%. Statistically, that’s very difficult to do. Several Fed governors have advanced different theories to explain why inflation is so weak. Some have argued that global supply chains allow producers to purchase products from low-cost areas, keeping internal price pressures low. Others have argued that real-time access to price information allows consumers to buy at the lowest cost, which continually squeezes retailers’ margins. Another theory states that an aging population—such as that in Japan, the EU, and the United States—spends less, leading to lower demand, which translates into less demand-pull price pressures. Also consider that commodity prices are weak across the board, keeping input price pressures at bay. The real answer probably encompasses pieces of all these theories along with others that haven’t been considered yet. But regardless of the cause, it’s difficult to see why people continue to assert that inflation will return to 2% in the intermediate term. The data simply do not support that conclusion.